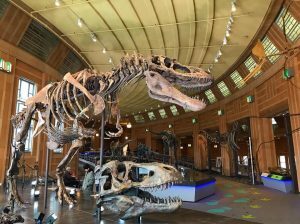 Home » Articles » Local » Experience Dinosaur Days at Cincinnati Museum Center! Take a step back in time this weekend, to when the dinosaurs roamed the Earth! Immerse yourself in prehistoric adventure for an entire weekend in the recently opened Dinosaur Hall at Cincinnati Museum Center (1301 Western Ave Cincinnati) this Saturday Feb 9 and Sunday Feb 10. Meet Cincinnati’s newest, oldest residents and speak with experts about all things extinct (and not so extinct). Learn about Cincinnati’s role in the world of fossils, get your hands dirty and be ready to dig up something exciting! -Meet Dr. Glenn Storrs, our Curator of Paleontology and Cameron Schwalbach, our Paleontology Collections Manager, to talk about all things dinosaurs and fossils. -Flap your wings and soar through the Jurassic environment in our virtual reality Birdly experience. The Birdly experience is located in Dinosaur Hall and can be purchased during the event: Member $5, Non-Member $6. Must be 58″ or taller. Dino Days are free for members or included with a Discovery Pass (with the exception of Birdly Experience). Adult tickets are $14.50, Seniors $13.50, ages 3-12 are $10.50, ages 1-2 are $5.50 and admission is free for those under 1 year. Purchase your tickets today at https://www.cincymuseum.org/dino-days/.